I planted the fall crop of broccoli for my summer CSA shareholders, around 600 plants, last Thursday. The rabbits completely ate the broccoli overnight. Where are the coyotes when I need them? Sigh. Good thing there were broccoli transplants left over. 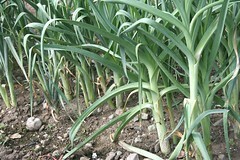 They were planted elsewhere on the farm and row cover laid in the tire tracks that border the bed. It’s too hot to put row cover on the crop, but I’ve noticed the presence of it near a crop seems to deter rabbits from venturing too close. Fall carrots, purple top turnips, kale and cabbage were all in the ground by the end of week. 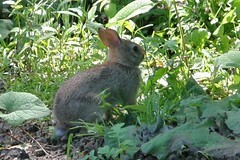 I’m going to be adventurous and try fall plantings of arugula, hakurei turnips and radishes. I’ve only grown these veggies in the coolness of early spring. All of them bolt quickly in the heat, so I’ll wait until mid- to late-August to plant them. 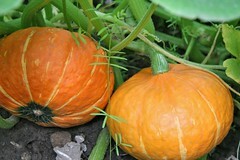 The winter squash and leeks that summer shareholders will get are growing well. 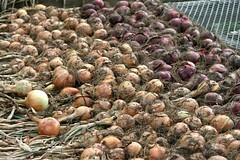 The storage onions are drying nicely, too.